To operate as an effective, vibrant SWE section uniquely enriching the lives of its members, supporters, and communities in East Central Iowa. The mission of SWE ECI is to provide a community in which women engineers and leaders can easily connect with professionals in the area, access valued resources, and promote a positive awareness of engineering; to motivate and facilitate the desire to aspire, advance and achieve. As a member of the Society of Women Engineers, you join a community that is dedicated to professional—and personal—success. SWE’s programs and partnerships support the retention and advancement of women in engineering and technology through career services, professional development and networking opportunities. Your SWE membership offers you the tools to advance, receive recognition for your achievements and inspire young women entering or considering the field. 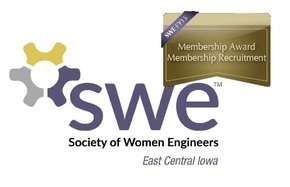 The SWE community consists of nearly 100 professional sections, 300 collegiate sections and members-at-large in all engineering and technology disciplines, making it easy to develop lasting connections and make an impact at the local level. SWE is the preeminent not-for-profit organization respected among the engineering community and technical societies. The SWE Career Center is the premier online recruitment resource for industry employers and recruiters seeking qualified candidates in all disciplines and at all career levels. The Career Center also offers hundreds of job postings and opportunities for members to post resumes. SWE provides multiple networking opportunities through the Annual Conference, Region Conferences and local events. Held in the fall each year, the SWE Annual Conference draws more than 5,000 women engineers and technologists as well as 250+ exhibitors in the largest Career Fair of its kind. Region Conferences are held annually throughout the first quarter. SWE members can find abundant professional development opportunities. Leadership training is available through the Society or partner affiliations; leadership experience is gained at every level of the Society; and podcasts and webinars give insights into various topics, from career development to diversity training. Members receive two complimentary publications regularly. The award-winning SWE Magazine is distributed quarterly and All Together—the members’ electronic newsletter—is distributed monthly.